Us American’s sure do like to make stuff bigger, badder and more extreme. Why would you ever want to eat a small order of fries when you can Supersize? Of course I would love to Double My Gulp while I watch constant repeats of Jackass (hands down one of my favorite shows ever). It seems no matter what it is, American’s have some desire to bring it to the extreme. Sometimes this is a good thing. Sometimes, we should have just stuck with the original. 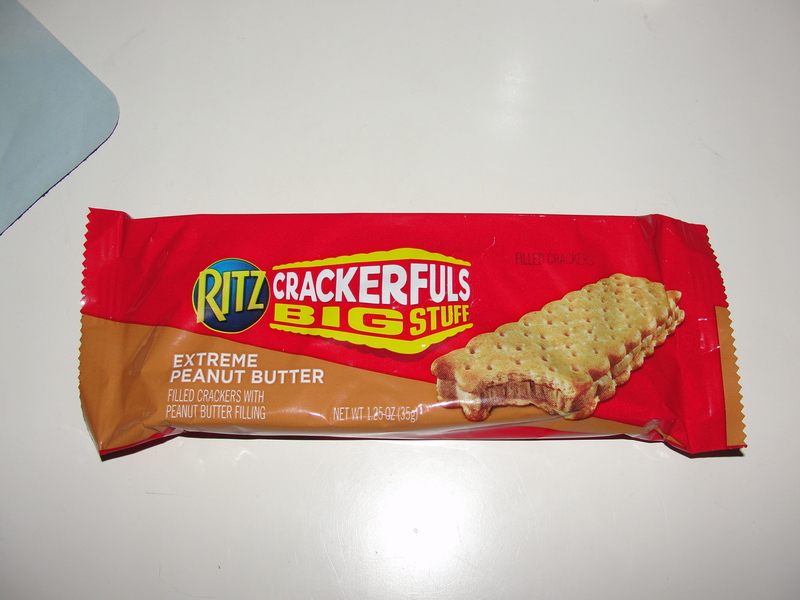 Ritz Crackers have come out with new Crackerfuls Big Stuff and I recently tried the Extreme Peanut Butter variety. All I can say is it was Extremely Not Good. I am a fan of the original Ritz Crackers Peanut Butter Sandwiches. I like the small crackers mixed with a touch of peanut butter. When I saw this Extreme variety, I figured I would like it even more. I grabbed a single sandwich at the store and saved it for a while. I am really bad at that…I buy something, save it and end up waiting 2+ weeks before I try & review it. Jeez Nicki. I was somewhat hesitant when I finally came to trying this as I had read some not so great reviews. But c’mon, its Ritz and Peanut Butter – that’s Extreme – why wouldn’t it be good? Well, it was really not good. I opened up the package and found the sandwich to be about the size I was expecting. Roughly smaller than an ice cream sandwich in length and about the size of a Double Stuf Oreo in height, this sandwich looked Extreme. I broke off a piece and placed it in my mouth. I was immediately hit with salt…and a lot of it. As I began to chew, the salt dominated not only the taste of the cracker but the peanut butter as well. It wasn’t until my second and third bite that my mouth had grown accustomed to the salt and I was able to taste the other elements of this sandwich as well. Bad thing was, the other elements were no better. This was not your usual Ritz cracker. No way. Beyond the fact that it was crazy salty, it was thicker and not as crispy/refreshing as a regular Ritz cracker. 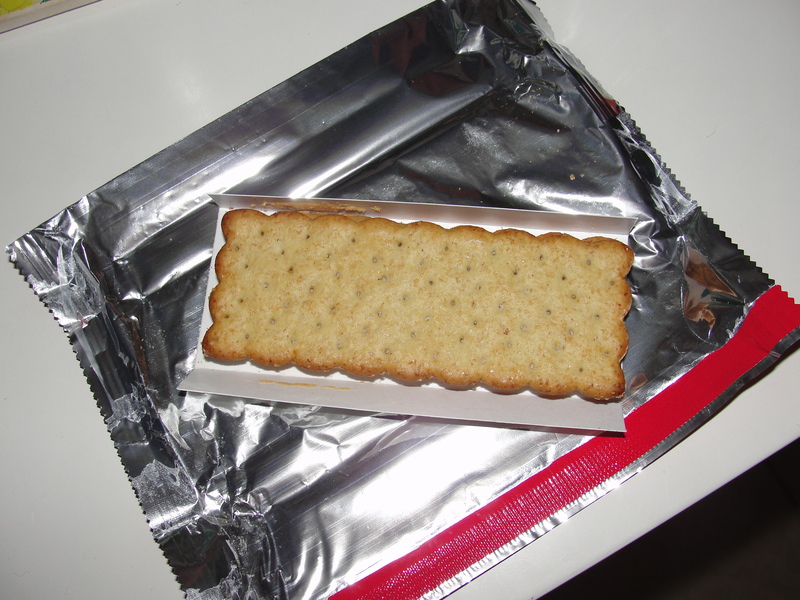 I did not taste the familiar buttery taste of Ritz crackers but rather tasted a thick piece of unflavorful cracker. I did not like the cracker at all. How was the Peanut Butter you ask? Yuck. It was disgusting. Horrible. Gross. Did not even taste like peanut butter. 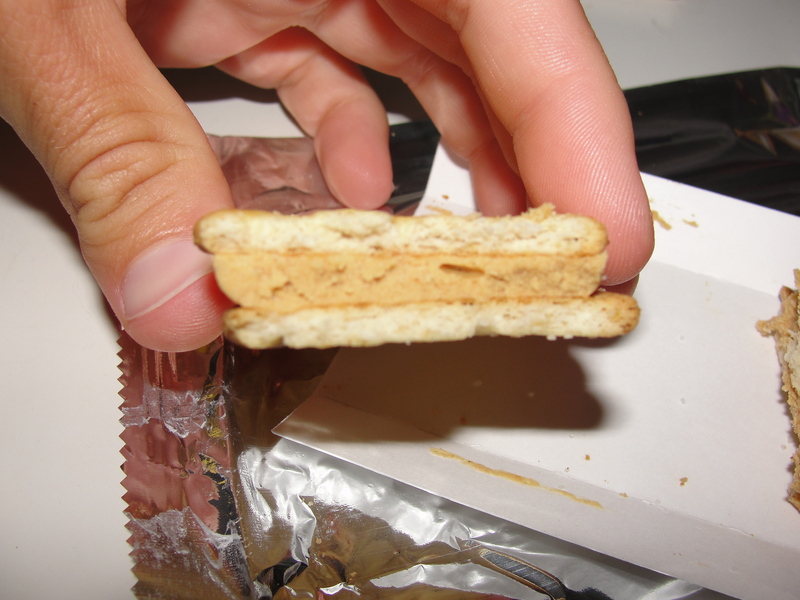 The peanut butter inside the cracker was crazy dry. It seemed to become dust as I broke off each piece. And the taste of it was even worse. I could taste the dryness of the peanut butter and the extreme lack of any flavor – no peanuts or sugar was tasted at all. Even though the taste was so bad, the dry consistency made it even worse. Yuck. I managed to eat almost the entire sandwich but had to stop with a few bites left. There was simply no use in continuing to eat this. It was gross. A total waste of food products and calories. Even though I hate to waste food, I just couldn’t finish this sandwich. My mouth was left as dry as can be and my love of Ritz was kicked down a few notches. Often times, bigger is not better. Ritz should have never come out with these – there was simply no need for it. I will never again be having a Ritz Crackerfuls Big Stuff, Extreme Peanut Butter. The dryness of the peanut butter in addition to the thick cracker PLUS the pound of salt, made the overall taste of this sandwich Extremely Not Good.